Borneo has been on my list of places to see for a long time, mainly to do with the wildlife & the rainforest which I have longed to visit even before I started my travel business. 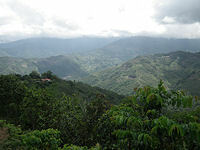 This is the place which has always brought to mind images of green forests, rivers, lakes and monkeys. It certainly did not disappoint on my recent visit. I also added a short trip to Brunei, a tiny independant kingdom situated between Sabah and Sarawak, the two states of Malaysia on the island of Borneo. 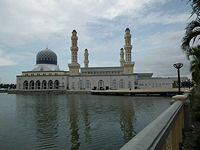 We arrived in the northern part of the island of Borneo, in the state of Sabah at the city of Kota Kinabalu. My first impressions were of a modern city. Due to the bombing during the Second World war the city has been re-built with only one or two historical buildings remaining in the town. We checked in at the 5* Sutera Harbour Resort Pacific Hotel. This large resort development also includes the Magellan Hotel & the Harbour Marina, Golf & Country Club. The resort is right on the seashore of the South China Sea with Kota Kinabalu city and the majestic Mount Kinabalu as its backdrop. The hotel also has its own private white sandy beach. This is a wonderful resort to be found so close to the city. 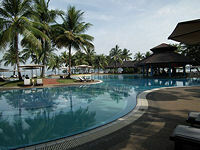 We are using this resort in our Deluxe hotels category for Kota Kinabalu. This afternoon our city tour included Signal Hill, Yayasan Sabah building, Market, Chinese temple, State Mosque & Sabah State Museum etc. By eight in the evening it was time for an early night due to missing out on sleep on the longhaul flight from UK the previous day. Next morning we checked out of the Sutera Harbour Resort & checked in at a lovely 3* boutique hotel, the Jesselton. This is the oldest hotel in KK, built in 1954 and its colonial building & style still remains one of the few historical buildings in town. The hotel is located in the the Gaya Street (Chinatown) area, with the waterfront a short stroll away. The rooms are a good size with elegant colours & decor matching the colonial period style. We are using this very high standard hotel in our Standard hotels category. Today we drove to Kinabalu National Park for the day. The journey takes about 2 hours. First we visited the Sutera Mountain Lodges for clients who wish to stay overnight in the park. There are many styles of lodge such as Kinabalu Lodge, Garden Lodge etc. These lodges are all very well designed to suit the environment with comfort & luxury but at quite high prices. We are using these lodges only if requested by clients. There are also other mountain lodges in the area that we use that have more simple & basic accommodation. After lunch we did a short trek in the jungle. True to the name rainforest, the rain bagan to fall but not heavily. The plastic raincoats provided by our guide covered us efficiently. The trees in the jungle also picked up much of the rain above us. The first thing I noticed as soon as I stepped out of the road into the forest was the change of sounds, from the noises of cars & people to the sound of insects & birds squawking above our heads as if they are welcoming us into their jungle. The sounds of the jungle also changed from one area to another following us on our path. The rain also added to the orchestra of sound in the wilderness. Everywhere I looked was covered with the colour green. There are so many different greens in the forest with the occasional splash of red, yellow or blue flowers displayed among the plants. My head was very relaxed like I was in a natural spa. We ended our trail with a visit to the Orchid Centre. Next morning was Sunday. This was a good day to stay at Jesselton hotel as there is a weekly Sunday Chinese market in Chinatown covering the street right in front of the hotel. The whole street is car free that morning as stalls are temporarily set up for the morning. 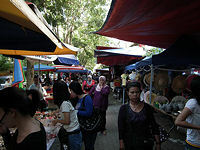 This is a very interesting market selling all sort of things - music cds, fruits & vegetables, flowers, plants, pets & household goods, local arts & crafts etc. All the chinese restaurants along the street were also open for breakfast offering noodle soup or chinese buns & dim sum. It very much reminded me of my early childhood days in the Chinatown district of Cholon in Vietnam. Cholon has now lost its traditional atmosphere compared to my day but Kota Kinabalu has retained the original spirit of the old Chinatown. The many old Chinese men reading their newspapers & eating the buns in the early morning cafés and restaurants resembled my father in those days. It was a most happy one hour stroll that Sunday morning.